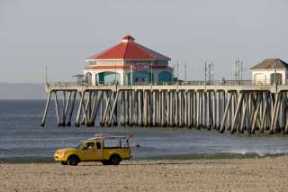 An overview of Huntington Beach Directions, parking, and beach hours. Located on the north end of Huntington City Beach off Pacific Coast Highway between Seapoint Avenue and Golden West Street. For more information, visit the city's home page. Photo courtesy of the Huntington Beach Conference and Visitors Bureau. Return from the Huntington Beach directions page to the Huntington Beach page.